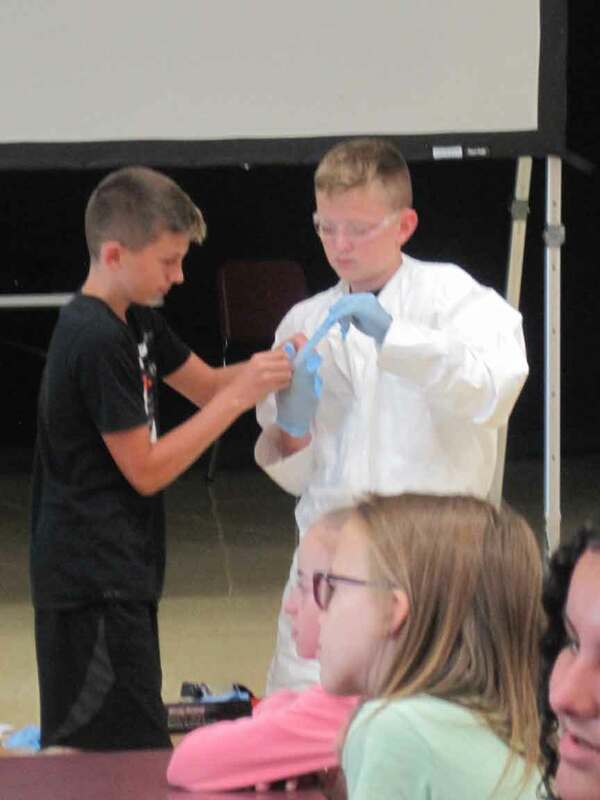 ANDOVER- A few lucky seventh grade students had the opportunity to see how colorant is made thanks to a career presentation offered by A-Tech Coordinators Denise Miller and Staci Zappitelli, along with Jennifer Kaplin and Kyle Corrigan of Chromaflo on Friday, Sept. 7 at PV Middle School. (From Sept. 14 edition). As noted through Miller, the presentation is a way to get the students excited about attending career day on Thursday, Sept. 20 at The Spire Institute, as well as teaches them about the different job opportunities available within the county. Of some of the topics covered during their presentation that day at the middle school included their background and experience, what they currently do where they work, what to expect on career day, as well as what Chromaflo does through a demonstration in which Leah Demoss, Sydney Morrison, Zane Neczeporenko, along with Caydence Wiser had the chance to experience by mixing colors. Time for questions was also offered as well. According to Guidance Counselor Katherine Jernigan the middle school has offered a career presentation for about five years now with this being their second year for including a local company. “It shows them there’s some good industries in the county and places they don’t know that exist,” said Seventh Grade Science Teacher Carissa Wludyga in agreement. Middle School Principal Hendrik Wolfert also seemed pleased with having a presentation available to the students as well. Pictured: Zane Neczeporenko and Caydence Wiser checking out the necessary clothing required in order to make colorant at Chromaflo.